You need a good product research tool to find the best Amazon products if you want to make heavy returns. Amazon has over one million new sellers almost every year, so if you sell on the site, or run your own private label business, be certain that there are thousands of people in the same niche as you, battling to topple your sales. It will help to get good Intel on your competitors and see where they are getting their products from, and that’s exactly what a product research tool will provide for you. When you first go to Amazon’s website to source for new products to add to your catalog, you are presented with way more products than you can scour through. If we are being honest, it will be physically impossible for you to analyze the thousands of prospective products while considering factors like seller competition and customer demand, on your own. 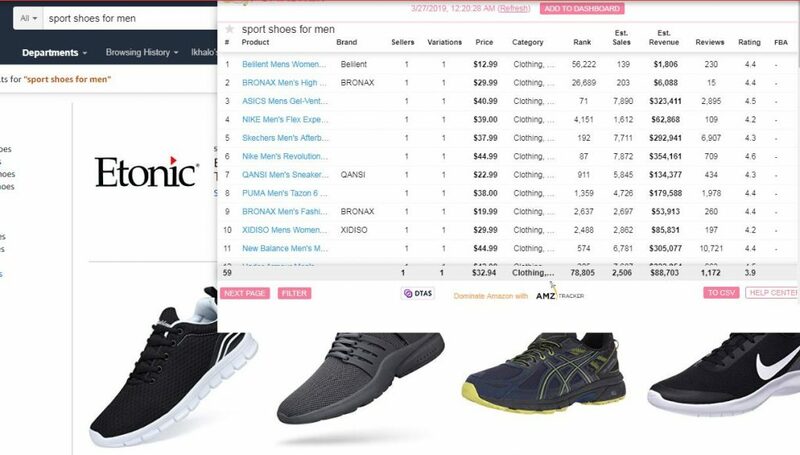 product research tool helps you to automate this process and provides you with a shortcut to identify the most profitable items to sell on Amazon. So in this article, I give you Unicorn Smasher and Jungle Scout; two amazing tools that will help you find new niches, track products, and direct you to set the best prices for your products. What is better than having a good Amazon product research tool? A good Amazon product research tool that is free. Researching products on Amazon can be likened to searching for a needle in a haystack. But Unicorn Smasher takes away the guesswork. With this product research tool, you no longer need to spend valuable hours creating a spreadsheet. You can get all the data in one click, right inside your browser. The dashboard is a fortress of research that organizes your products in one place, take a deep dive on variants, and export to a CSV file. Unicorn Smasher works just like Jungle Scout chrome extension. To get started, you will need to install the tool on your chrome browser. After you have done that, you can then navigate to any product page on Amazon. The tools will only work if you have searched for a keyword or phrase using the Amazon search bar. When you click the Unicorn Smasher button at the top of the right corner of your browser, you will get a detailed report about the products on that page and their performance and potentials. You can then review and analyze this report to determine the most profitable product to sell. Unicorn Smasher is a product of AMZ Tracker, which is a paid tool, and just like Facebook, Unicorn Smasher mostly makes their money by promoting their sister application and allowing companies to advertise to their users. A lot of people do not know about this awesome feature because it is positioned at the bottom of your product research result. It makes life a lot easier for any seller as it allows you to cut down on your search by specifying certain aspects including price, sales rank, reviews, ratings, etc. 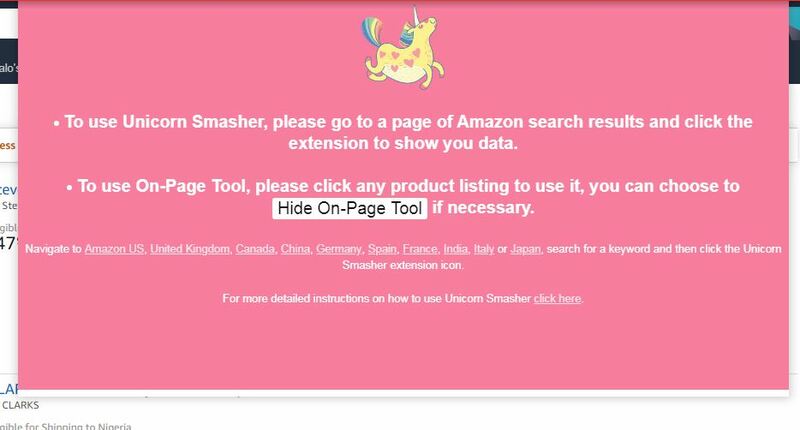 When you search for a keyword or phrase and analyze it with Unicorn Smasher, the result stays on your screen until you carry out another search. If you don’t want to lose this data, you can add your results to the dashboard and it will be saved within the tool’s widget which you can access at any time. If you don’t want to save your product search result within the widget, you can simply download it as a CSV file where it can be opened with spreadsheet programs such as Excel. This is especially helpful in research and data analysis since CSV files are recommended formats to compare data. 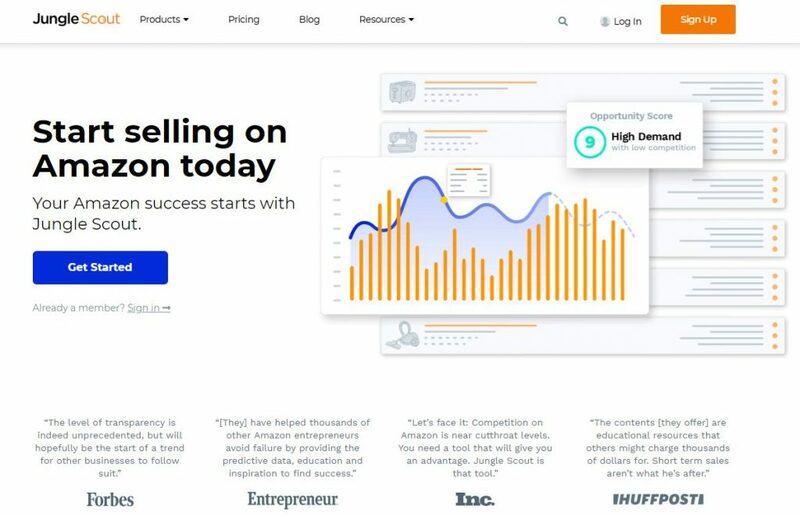 jungle Scout is going to help you with your product research when you are just starting your Amazon FBA business and you are looking to source your products online. But if you don’t have Jungle Scout, and you’ve already got a product, it’s still a great option for you. Before now, tools like Jungle Scout didn’t exist, so Amazon sellers had to do everything manually, and it took a lot of time. But now these tools exist, FBA marketers can save time, speed up the process, and get much more accurate information and data. 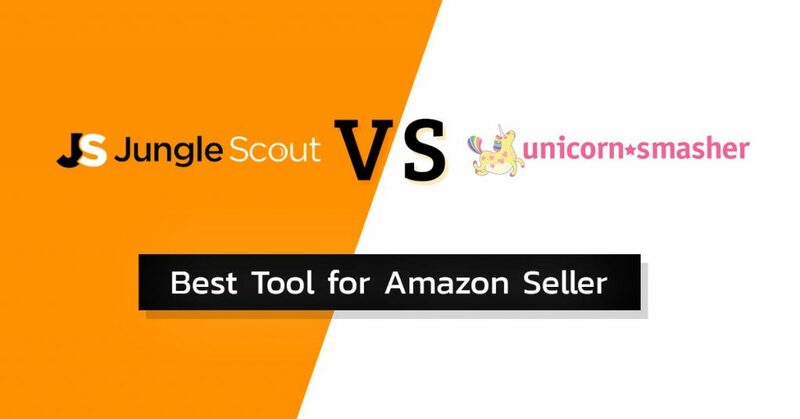 So while there are so many Amazon product research tools out there, Jungle Scout is one of the most recommended by top sellers in the industry. If you pull a product to search for on Amazon, you’d want to have an overview so that you can see the stats for the product niche. You’ll need to install the Jungle Scout Chrome extension to do this. When you have successfully installed the extension and you click on it, it will automatically pull up all the information about the products on the page in a matter of seconds. Based on this valuable information, you can make your decisions on the products you want to go into. Aside from the Chrome extension, Jungle Scout also has a web app where you do the actual product research to find your ideal products in the first place. Part of the reason Jungle Scout is very popular among the top sellers in the industry is because of the many features that it comes with. So let’s talk about the features you will unlock when you enter your Jungle Scout dashboard. 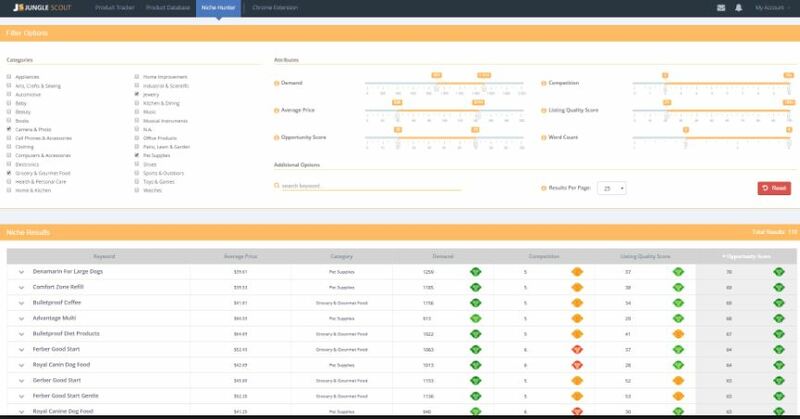 Jungle Scout lets you easily keep track of your products to see which ones are performing well and which ones are not, with its product tracker feature. With this, you can monitor any number of products on Amazon at any time. First, you can add products to your product tracker by going to the top of your browser to copy the URL of the Amazon page that the product is in. Or you can copy the ASIN at the bottom of the page. 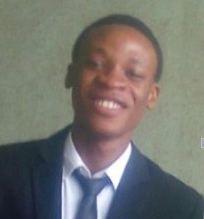 When you paste the URL or ASIN that you have copied, the product will be added to the tracker. After you add the products, it will take up to two days to generate sales data. And it doesn’t give you historical data as it tracks in real time starting from the date that you added it. You can also create categories to make it easier to sort through the products however you like. If you want to get more details about a particular product you are tracking, you can change the date range between 7 and 60 days to see data across the number of days. The tracker will show you the inventory for the days, the number of units sold, BSR rank, and the buy box price. So with the product tracker, you can add products to monitor across time, create categories to sort them out, view additional information about them, and that’s about it. At its core, Jungle Scout product database will help you find products on Amazon based on products that already have a high selling rate. 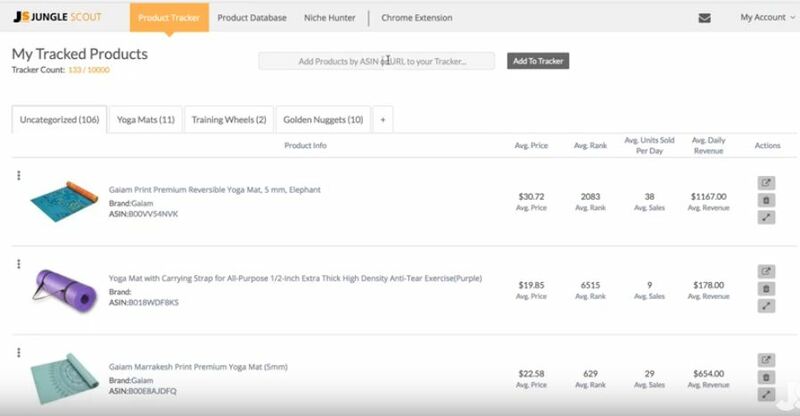 With this feature, Jungle Scout has successfully recreated Amazon’s catalog to be more user-friendly for their sellers. It has an advanced filter option that lets you cut down on your choices with as many specifications as possible. You can save yourself the trouble of going through millions of products by filtering it down to the best tens or hundreds. 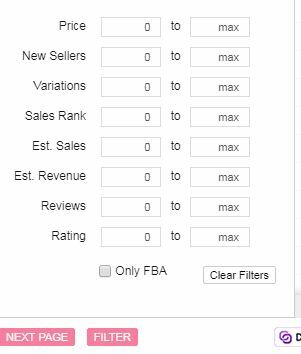 The system will only show products that are within the categories you chose, and also factor in the criteria you set in the filters. Jungle Scout works with nine marketplaces for their product database. Jungle Scout has taken all the products in these marketplaces and compiled them into this enormous database of millions of products. This feature is also perfect if you don’t know what you want to sell on Amazon, as the database will help you generate ideas. After your search, you can download the results to view them in a spreadsheet later on. The listing will be displayed with all the information from the filter. You can even check the keywords clout to see the most used keywords within the listing and title. Niche hunter is the easiest way to identify niches and keywords that can be great opportunities on Amazon. It is an additional product to the Jungle Scout product database, which is the main method people use to find products. But finding products using niche hunter is a lot faster than using a database. You choose the categories that you are looking for in a particular niche whether that is a specific category or attribute. The niche hunter has tons of categories. And the attributes you will find includes average demand, average price, opportunity score, competition, list quality score, and word count. Then, the niche hunter easily provides your ideal niche and keyword opportunities. After filtering, you will see the result instantly. You can dig in deeper to see some important analytics about the top products in that niche, like the estimated sales per month and number of reviews. If the niche doesn’t convince you, the niche hunter provides a list of related keywords that other customers look for. It is just like casting the widest net in the ocean while maintaining the precision of spearfishing. You can use this tool to uncover tremendous opportunities on Amazon in a scalable and repeatable manner. The Jungle Scout web app has three different choices that you can go with – the Start-Up, Standard and Business plans. The key differences between the three is that the Start-Up plan does not include niche hunter and it allows only 1 user. 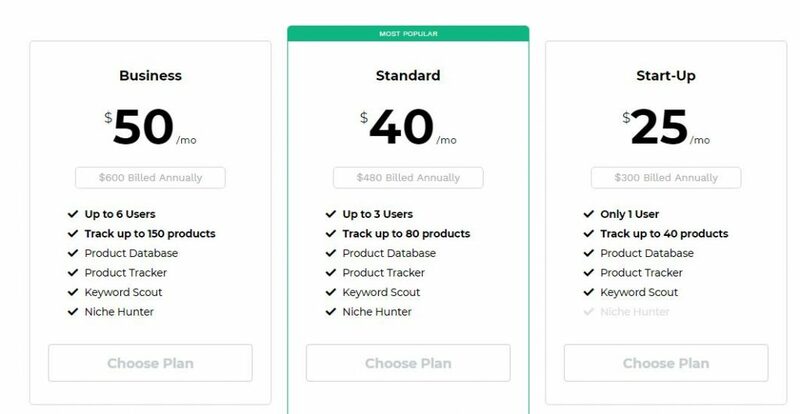 The Standard plan does, but it allows only a maximum of 2 users.And Business pricing tier allows up to five users. 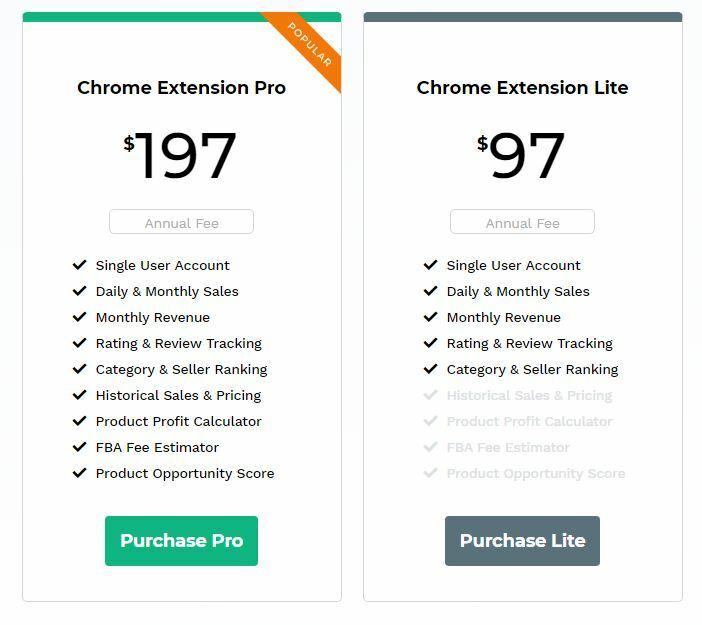 The Chrome extension has the Extension Pro and the Lite versions. In addition to the features of the Lite version, the Pro Extension includes historical sales and pricing, product profit calculator, FBA fee estimator, and product opportunity score. Just about anyone would be happy to have a free tool, but it doesn’t always translate to value. Unicorn Smasher as a free product research tool is nice, but it doesn’t come anywhere near the functionalities and the level of accuracy that Jungle Scout provides. If you are just starting out and you want to first get the hang of selling on Amazon, then Unicorn Smasher can be of help there. But if you are serious about selling on Amazon, only a high-level product research tool like Jungle Scout will do.